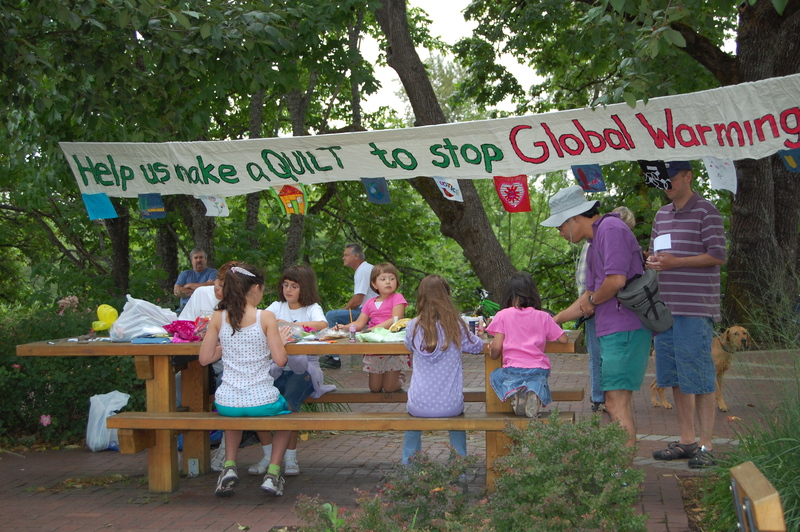 You can sign this quilt – and help stop climate change! You can help by signing the back of the quilt, and asking your friends to sign. 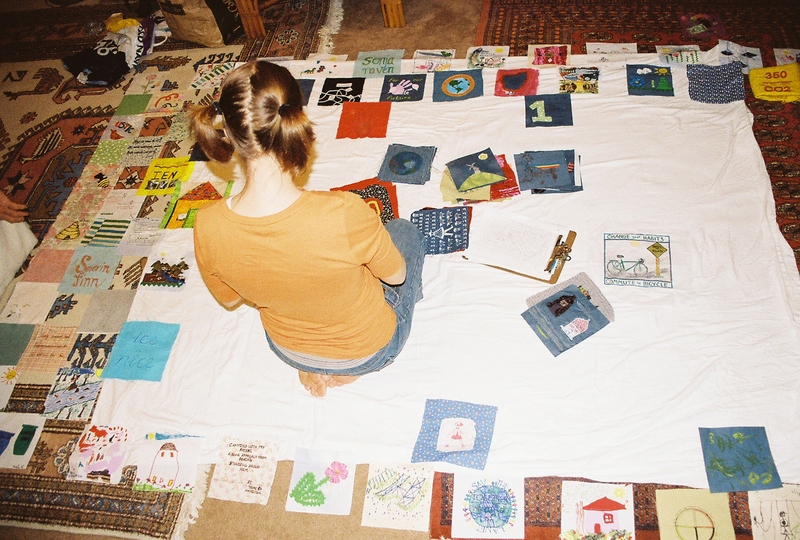 I took the quilt to DC on November 18th, 2008 for a national day of action on climate change with 1Sky and 350.org, and delivered a framed photograph of the quilt together with a letter to President Obama’s transition team. But I‘m going to try and give him the quilt on Oprah’s show, so you can still add your name. To sign the quilt, send me a comment by clicking on the word “comments” below, with your name, and the city and state you live in, and I will write your name on the back of the quilt. 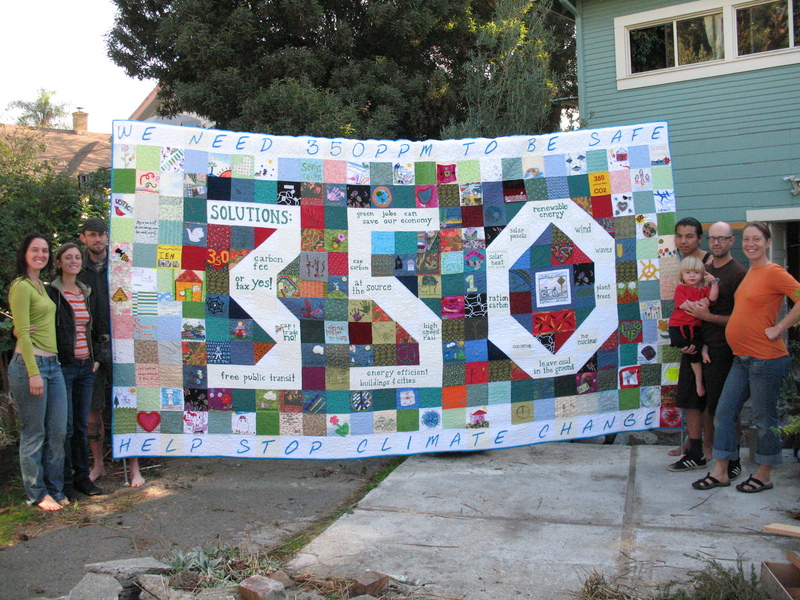 The Solutions to Climate Change quilt has 350 pieces, to represent the 350 parts per million of carbon dioxide (CO2) that NASA climatologist James Hansen has said is the maximum safe level of CO2 in our atmosphere (we’re currently at 383 and rising fast). We are currently facing the biggest threat to life on earth since the last mass extinction 65 million years (think dinosaurs). That’s the bad news. The good news is that scientists say we can still reverse global warming, if we act soon. We need to demand that our new representatives in government take this problem seriously and make climate change a priority in 2009. There are also many ways for each of us to get involved, the more the merrier. Although it seems incredible, the technology exists to fix the atmosphere. That doesn’t mean it will be easy. Stopping dangerous climate change will require a massive effort on the scale of World War II. We need to re-tool our economy so that it is more efficient, start using clean energy, and change our transportation habits. To do so will require significant investment, but will very likely also fix the recession that we are now entering, and create a safer and less polluted world. The solution to global warming has many different pieces. I have made a quilt that expresses some of the ones that I and many others believe are crucial to fixing the problem. 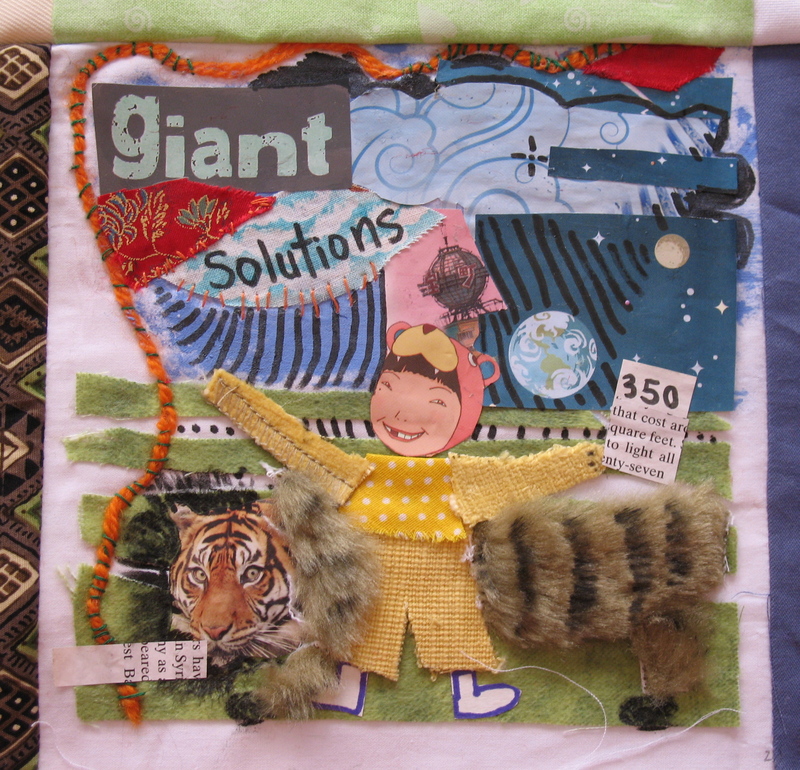 For more information on the ideas expressed on the quilt, see “Solutions to Climate Change” below. I started this quilt in June of this year, when my son was 1 year old. I had recently started learning more about global warming, and realized I needed to do something, for my own sanity, and to help his chances of having a decent future on this planet. I wrote to friends and family and asked them to make squares, and started bringing my box of craft supplies and a banner to parks and farmer’s markets. It was a lot of fun to talk to people about the project, and to make art with kids. I got a lot of encouragement, as well as lots of lovely square (see Photo Gallery) . I also went to two quilt groups in the Bay Area to ask for squares (which are really called “blocks” in quilter language), the African American Quilt Guild of Oa kland, and the East Bay Heritage Quilters. 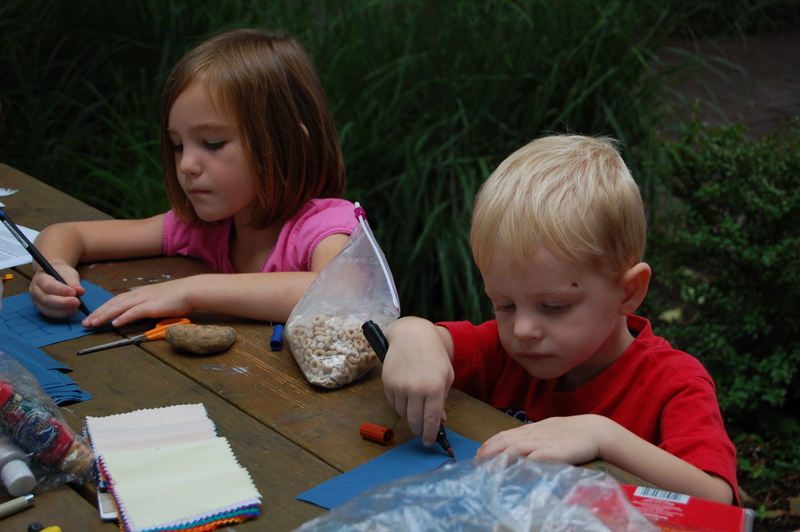 I got a few blocks from them, as well as assistance in piecing (sewing the blocks together). Teresa Weyand, owner of Qreative Quilting and a professional quilter in Alameda, CA , generously offered her services for free to longarm machine quilt and bind the quilt. The finished quilt measures almost 8 x 14 feet! I will be bringing the quilt to President Obama on November 18th. Some national climate change organizations, 1Sky and 350.org have organized a national event to “welcome” our President and new representatives in Congress, with the demand that they make climate change an immediate priority in Washington. I will be showing the actual quilt here in California as well, in November and December. To find out more about showings, send me a message by clicking on “comments” below. We must work to stop climate change. We cannot wait. The solutions exist, but they require us all to take action, now. The new President needs to prioritize climate change in the first 100 days. Our representatives in Congress need to put it on the top of their agenda. There are many different things we can do to solve climate change, below are a few that I and others believe are crucial pieces of the puzzle. Public transportation/high speed rail: Transportation accounts for 30% of the carbon dioxide emissions in the US. Making public transportation more accessible and affordable is a necessary step in the path towards a sustainable future. High speed rail is more energy efficient than air travel and uses less land than highways do. Energy efficient buildings: Energy use in buildings contributes to about a third of greenhouse gas emissions globally. So making sure that buildings are built efficiently (using LEED – Leadership in Energy and Environmental Design standards) as well as providing funds for retrofitting existing buildings, is an important piece of the puzzle. Renewable energy: There are different ways of producing energy without releasing carbon dioxide into the atmosphere. Clean coal is not one of them. The technology simply doesn’t exist yet. Nuclear energy is dangerous and expensive to produce. The renewable energy sources that hold the most promise are wind, solar cell panels, concentrated solar heat, produced using mirrors, and possibly wave technology. Scientific American reported that converting only 2.5 percent of the sun’s radiation in the Southwest of the US into electricity would match the nation’s total energy consumption in 2006. Our new President and representatives have the power to implement these changes. We have the power to keep reminding them that we care about the future of the planet, and to become involved in these projects ourselves. Together we are strong. Quilt goes to DC for national day of action!